And then there’s this little project of mine. 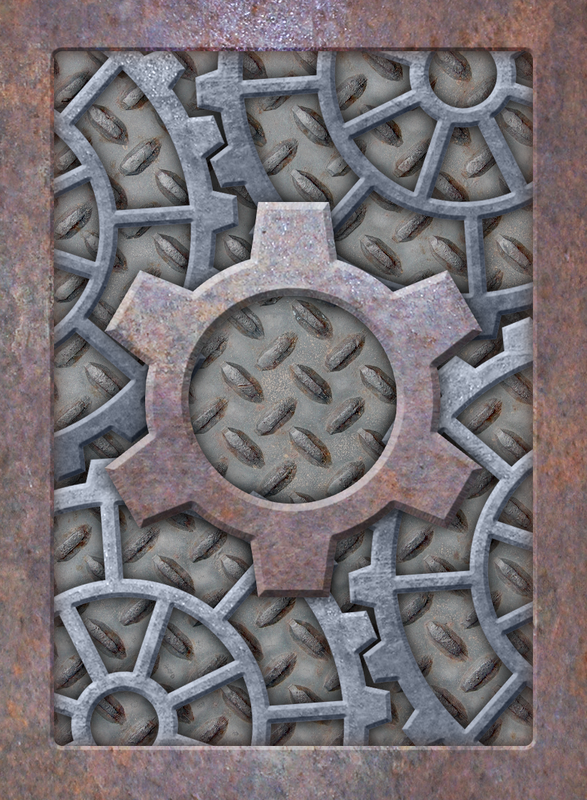 It’s more “gearpunk” than “steampunk”, I guess, sort of like my gearpunk dice or my snowflakes, but it’s fun to create anyway. Once I get this standard card set done, I’ll offer it for sale via TheGameCrafter.com, so I’ll post about it again later. In the meantime, any recommendations for the Kings, Queens and Jacks? 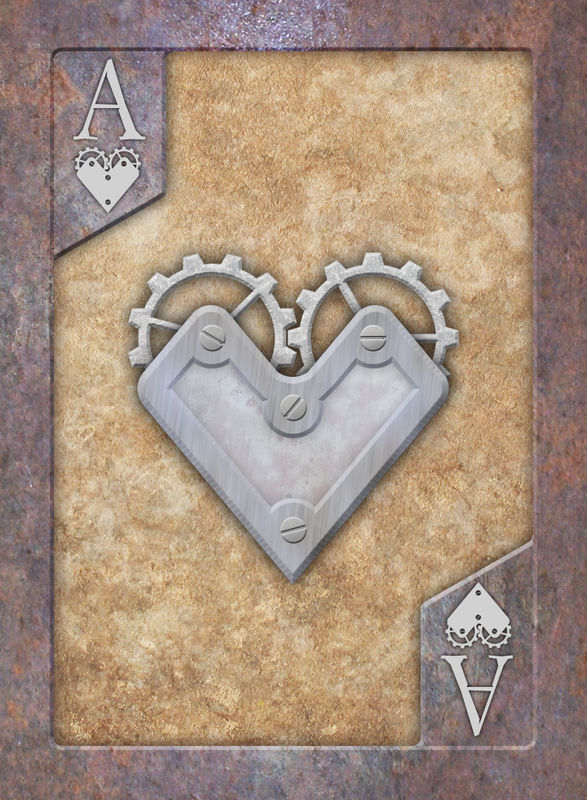 I have some ideas like Ada Lovelace for the Queen of Hearts and Tesla/Edison as dueling Jacks or Kings, but I’d love to hear what others think. Yesterday I was experimenting in the kitchen again, starting with a simple request for white fudge. I made one batch, then decided I had enough materials for another one. I figured I’d try a variant, a French vanilla fudge. What happened was a glorious failure. I wound up with something more like French Toast fudge than French vanilla. It’s my favorite non-chocolate fudge… so far. I’ll do more experiments later, though, no rest for the mad scientists around here. Beat egg, vanilla, cinnamon, butterscotch flavoring and toffee flavoring until well mixed. Set aside. Mix butter, evaporated milk, and the sugars, bring to boil over medium heat, stir frequently. Add marshmallows, marshmallow cream, stir to smooth a bit, then add white chocolate. Stir until smooth, pour into 9x13ish pan, let cool. There’s room to fudge the measurements, a little more sugar, a little less marshmallow, less butter, whatever, and the butterscotch and toffee are really just a garnish. They could be emphasized or ignored, depending on your tastes. The key is making sure the egg mixes in nicely and doesn’t clump up. So… what? What does it matter that I made some weird fudge? This is also relevant when taking look at “artsy” games, like the PS3 gem Journey. Y’see, it effectively bankrupted the company that made it, thatgamecompany. It’s an “experience” game, all about the journey, if you can imagine. It’s short, beautiful and atypical. It won a handful of awards at DICE, well deserved. Austin Wintory, the composer, won an award for the soundtrack, and it was the first game soundtrack that earned a Grammy nomination. That’s srsbzns, or whatever the kids call it these days. Journey is kind of a big deal, artistically. Commercially, however, it wasn’t all that and a bag of chips. It eventually paid for itself “and then some”, but we’re not talking blockbuster Halo, Call of War numbers. There’s a bigger discussion there about commercial viability, gamer tendencies and the intersection between art and commerce, and maybe I’ll dig into that more at some point (there are plenty of articles out there on it already), but at the moment, I just wanted to underscore the creative impulse. Sometimes, creators just want to create. Sometimes we want to share. Whole communities are built on that philosophy. I think it’s a healthy part of this human condition, and that’s why I keep coming back to this blog and what I do in my “off hours”. I do make games for a living. I also make them on my own because it’s great fun to do so. I write about them and share them because, well… sharing somehow makes it more real, that I’ve contributed something to the world. I kinda like this place, and I want to do my part to make it a little nicer.